Get top quality, reliable shade with the Quik Shade C100. This 10 x 10 straight leg canopy offers up to 100 sq. feet of shade and up to 3 height positions. Shades between 8 to 12 people. Includes a wall panel for added sun protection and privacy. Great for farmers markets, backyard shade, outdoor receptions, sporting events and much more. The beautiful Giulio Barbieri Vela Free Standing Canopy is the perfect shade structure for your backyard, on the dock, or over the hot tub. Its unique design allows for quick and easy removal of the top canopy if needed to protect against winds. The two PVC top membranes are easily rolled up with the side mounted hand operated crank system. The structure is stronger than most pergolas on the market and is designed for commercial use. This stunning structure has a cover made from Ferrari special pre-stressed PVC fabric which is extremely easy to clean, flame retardant, Fade resistant and designed for outdoor use. The structure is made from 4 3/4-inch Dia aluminum posts (8 included), cataphoresis treated and coated with polyester powder similar to the auto industry for years of rust free, fade resistant use. All nuts and bolts are stainless steel. Protect your vehicle from the harsh summer rays with the Impact Shelter by Impact Canopy 10'8" x 20' Multipurpose Canopy. The sturdy frame is constructed from 34mm white powder coated steel. Impact only uses top quality outdoor powder coat paint for all frames to prevent from weathering. The cover is custom fitted for long lasting use made for high quality 170 gram PE with UV and Fire Inhibitors. All seams are heat welded to ensure water resistance and protection of shelter. The custom fitted cover features leg skirts at all four corners to ensure a snug fit and also provide additional appeal. Impact Canopy design frames are No Tools Required for assembly. Thumb buttons at each fitting for ease of setup - also secures frame for when removing cover. The Quik Shade Expedition OnePush revolutionizes canopy assembly! This quick and easy one step process makes out of the box assembly simple thanks to its instant setup mechanism. The One Push canopy features quick release push pins offering you three height adjustments for your canopy. Rigid overlapping eave construction offers stability to the frame, and the 150D polyester top with Aluminex provides up to 99% UV protection. 8 x 10 ft. canopy, up to 80 sq. ft. of shade. The Quik Shade Summit X offers sturdy, reliable shade where you need it. Features a rigid 12 x 23mm patented double reinforced frame system and Quik Release pull pins for up to 3 height adjustments. Micro-Glide Teflon bearings make it easy to move the canopy up and down. Features a 300D polyester top with Aluminex for 99% UV protection and pre-installed Super Vents for superior airflow. 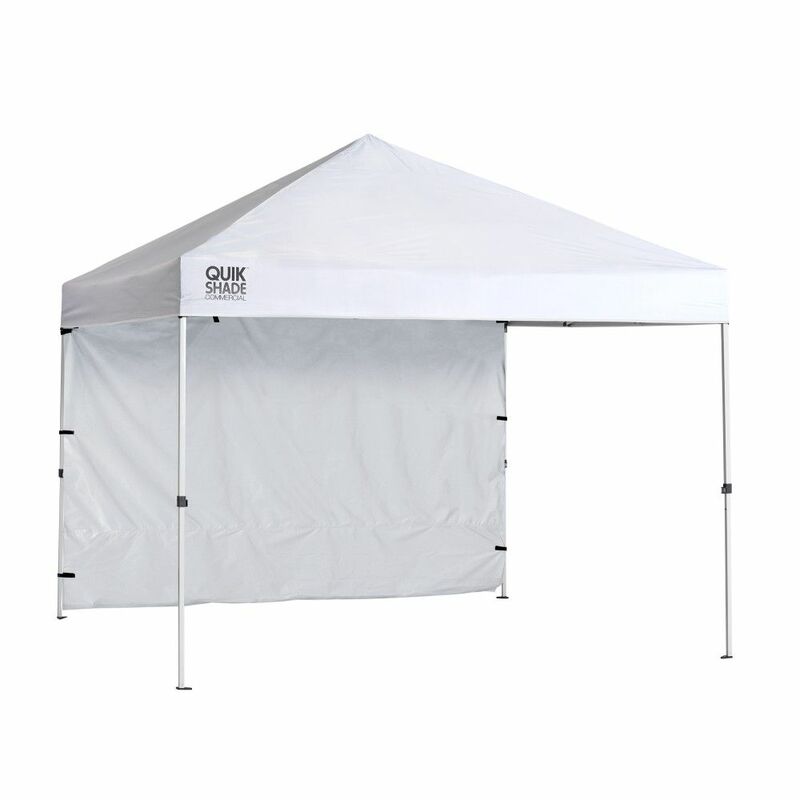 Commercial C100 10 x 10 ft. Straight Leg Canopy - White Get top quality, reliable shade with the Quik Shade C100. This 10 x 10 straight leg canopy offers up to 100 sq. feet of shade and up to 3 height positions. Shades between 8 to 12 people. Includes a wall panel for added sun protection and privacy. Great for farmers markets, backyard shade, outdoor receptions, sporting events and much more. Commercial C100 10 x 10 ft. Straight Leg Canopy - White is rated 3.9 out of 5 by 112. Rated 3 out of 5 by Matth from The plastic on the frame gussets are brittle. Two of... The plastic on the frame gussets are brittle. Two of four broke first time out of the bag. Also the release buttons to drop the legs and truss are not user friendly and pinch your hands if not very careful. Rated 5 out of 5 by Ravae from The canopy was even nicer than I expected. The quality of the materials and structure were just p... The canopy was even nicer than I expected. The quality of the materials and structure were just perfect! Rated 1 out of 5 by Tom from Received the canopy in a timely manner, but it was broken in 2 places. Received the canopy in a timely manner, but it was broken in 2 places. Does rain slide off the canopy well or does it tend to pool on top? It does state in the paper work that comes with the product that the canopies should be taken down in rain to avoid any damage. What is the denier grade of the roof? Is it waterproof? Is it silver on the inside or white? The top is 300D with 99% UV protection and our Aluminex backing which is silver on the inside. The tops are water resistant. In the picture, it looks like there is one side panel - is there a side panel(s) included? if so are they canvas or screen? This unit comes with 1 wall panel which is not attached to the top and can be removed if needed. It does not come in canvas and we do have screens that will fit this unit. Please visist www.quikshade.com for accessories. Is this commercial canopy fire rated, and if so, what rating(s)? do these come with a side wall? is a replacement top available?